Many people's adult bios can be easily summarized mathematically. Got up, got ready for work, went to work, came home, ate, puttered around the house, went to sleep - times 365 days, times x years. Others pack their lives with so much adventure that a condensed version of their 10 year bio can read 10 pages long. That's the math as applied to Kat O'Sullivan, self proclaimed gypsy and itinerant global nomad. 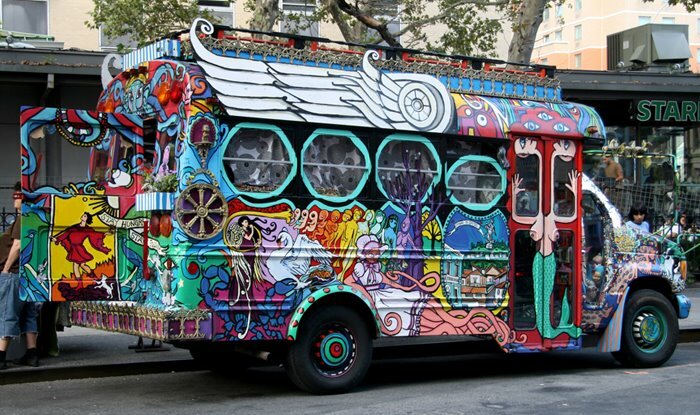 I have passed by both this art bus and the street vendor with her table of recycled clothing numerous times. I never knew there was a connection between them. So for the first time, I made the acquaintance of Kat O'Sullivan, who graciously greeted me when seeing my interest in photographing her vehicle. She invited me to go inside her bus - you can see photos here. You can also see her recycled clothing , details of her life, art projects and media articles at her website, Katwise.com here. Here are some of the highlights of her nomadic life: born 1976, finished high school in two years, attended over 200 Grateful Dead concerts, lived with a hill tribe in Thailand, worked for Mother Teresa, lived in a bus she painted psychedelic colors, graduated Phi Bet Kappa from UC Santa Cruz (anthropology), had a pet monkey, worked in the Hamptons as a yachty, attended Burning Man (no surprise there), worked as a translator in the Chilean jungle, crossed the Sahara desert, sold Christmas trees in Harlem, worked with street children in the Philippines and at an orphanage in the Guatemalan jungle, hitchhiked from Ecuador to New York. She also avers "I have never used any drugs, never got arrested, never borrowed money or went into debt, never even got a stupid tattoo (or any tattoo, for that matter.) I was a straight-A student all through High School and College. Every step of the way I had the blessings and support of a gorgeous, loving family." A colorful life, wouldn't you say?